- FOR APPLICATIONS THAT REQUIRE A CONVERTER LOCK-UP in applications UP TO 500 H.P. These Race Built converters provide superb performance, reliability and efficiency in many Street, Street/Strip, and High Performance applications. [The flash stall is the r.p.m. point that is obtained under the full throttle launch off the starting line after the brakes have been fully released] WITH MINIMUM SLIPPAGE throughout the power range. By reducing slippage after the launch, more of the torque can be utilized to power the vehicle resulting in more miles per hour without r.p.m. increase, reduced heat and engine wear. * At flash stall, the converter multiplies the torque being produced by the engine at that specific r.p.m. by up to 2.5 times, to the drivetrain. The further into the powerband of the engine, that flash stall occurs, the higher the torque number that you multiply, resulting in much more power to the rear tires to accelerate the vehicle. FOR STREET APPLICATIONS, the unique design also makes these converters an excellant choice for vehicles equipped with lock-up overdrive transmissions, with aftermarket camshafts and/or performance improving upgrades used on the street. Our 10 3/4" XPL series,is a very streetable converter, without the normal throttle r.p.m. flair up and the need to rev the engine to get it moving, encountered with other brands of converters. When the converter clutch is activated by the transmissions valvebody, it makes a mechanical coupling between the converter face (front cover) and the turbine (which houses the spline that drives the input shaft) that eliminates slippage of the two components resulting from the normal fluid drive function. This function is called LOCK-UP. 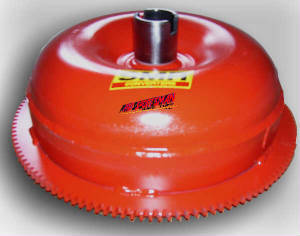 The efficiency of this converter, is enhanced with the lock-up function, when operated at the very low r.p.m. cruise speeds of late model (1990 and newer) vehicles equipped with overdrive transmissions. The low r.p.m.range operation does not generate the centerfugal forces of the drive fluid necessary within the torque converter to adequately transfer the power to the turbine. By adding the lock-up clutch, the converter regains its' efficiency and substancially reduces heat which would otherwise be generated by the shearing of the fluid. The XPL series converter is only available in a 10 3/4" unit and in various configurations to provides flash stalls of up to 3000 r.p.m. The reason this model is not available in a higher stall, smaller diameter converter is: (a)- Reliability -because a smaller converter would not provide a large enough surface area for a clutch plate capable of carrying the load; and (b) Volume efficiency- the smaller converter has less fluid and fewer fins in the pump and turbine, substancially reducing its' ability to support the load on the turbine and drastically increasing the load placed on the smaller clutch to carry the load. However, just like the Pro Sportsman race tuff series, when the accelerator is floored from a standing start, the converter flashes to its' designed r.p.m., pauses at this r.p.m. point while multiplying torque to the driveline (by up to 2.5 times what the engine produces) until the driveline reaches this speed and then the rpm increases as it would with a stock converter. Only when the lock-up clutch is applied by the transmission valvebody or electronically by the operator, does the converter clutch provide the direct coupling. This function usually occurs in lower r.p.m. cruising conditions. Under hard accelleration,above stall, higher r.p.m. conditions the converter has the same efficiency as a stock non-lock-up converter and the lock-up is not necessary or desirable. IN ORDER TO WITHSTAND THE PUNISHMENT OF HEAVY DUTY, HIGH PERFORMANCE and STREET/STRIP USE, THE SMR XPL series, are constructed with the same heavy duty components as our PRO SPORTSMAN race tuff series 10 3/4" converters, with addition of a heavy duty KEVLAR clutch component. WE DON'T COMPROMISE QUALITY. WOULD YOU?